SUMMER TRAVELS. For those fortunate enough to have a generous travel budget, choosing the best beach at which to spend the holidays can be an exhausting task. 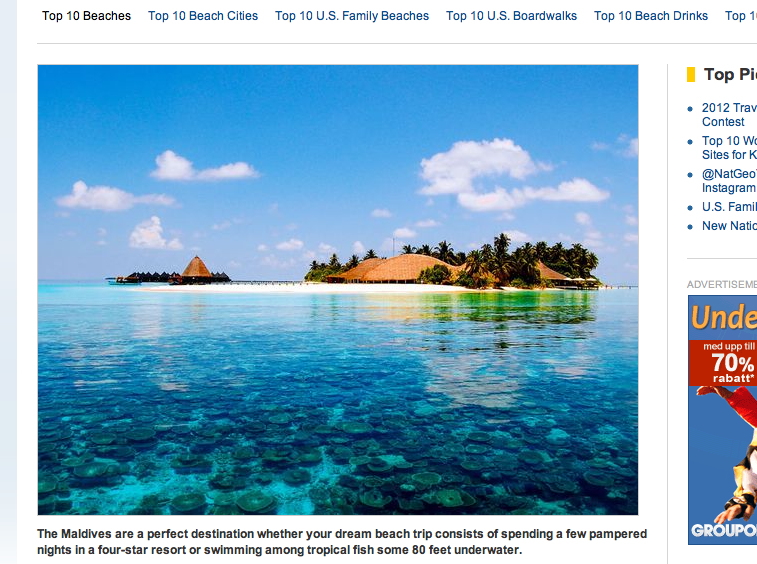 How lucky then, that the web is overflowing with lists ranking what is said to be the world’s best beaches. The Traveling Reporter has dived into the world of azur blue corral reefs and white beaches, and come up with our own list, not covering the best beaches themselves, but the 5 best beach ranking lists. It is a subjective selection, of course, but we dare to guess that by browsing these sites, you will have covered 99% of the world’s beaches worth mentioning. The way we see it, if you put together the best beach ranking lists, someone somewhere has got to have the best beach, too. 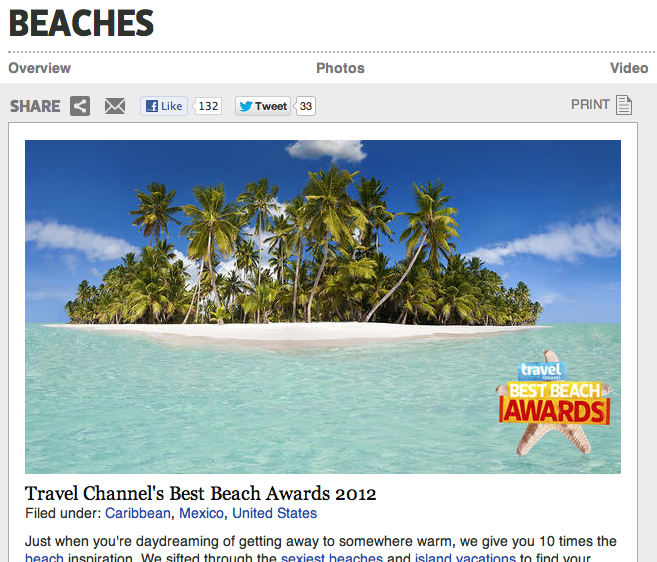 Ten best beaches, Travel Channel. • The Travel Channel has put together a list, after conducting a large survey, covering what the site claims are the best beaches out of a wide range of categories. Best party beach, sexiest beach, best beach for families, and so on. Altogether there are ten categories, and you are bound to find at least one or two sandy spots that fit your needs and expectations. 1,200 votes lies behind the selection of beaches that made it onto the list, and that also singeled out the world’s best beach, all categories, as being the Lahaina Beach on Maui, Hawaii. • Covering places like Langkawi in Malaysia, Kauna’oa Bay on Hawaii, and eight beaches in between, the ever-good National Geographic features a beach list that is impossible to skip. The list has web links to all the places, and provides basic facts of each beach. • There are websites for everything. 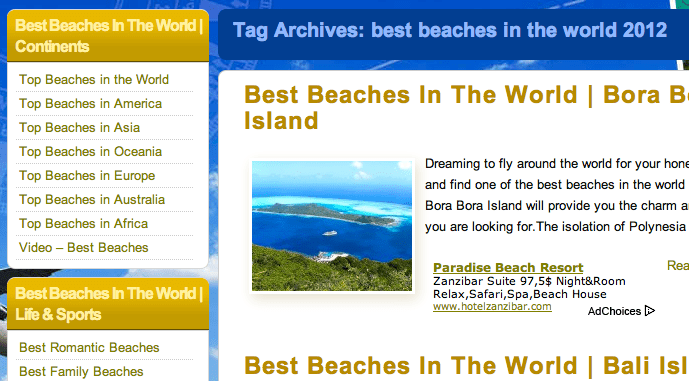 Consequently, for those who can’t get enough, there is the topbeachesintheworld.net. Bora Bora, Bali and Anguilla are among the ones that the site deem as the world’s best this year. If you are a beach freak, you’ve got to check this out. The website features multiple ranking lists of all kinds of beaches, so not finding a good spot here is nearly impossible. Best beaches, according to livescience.com. 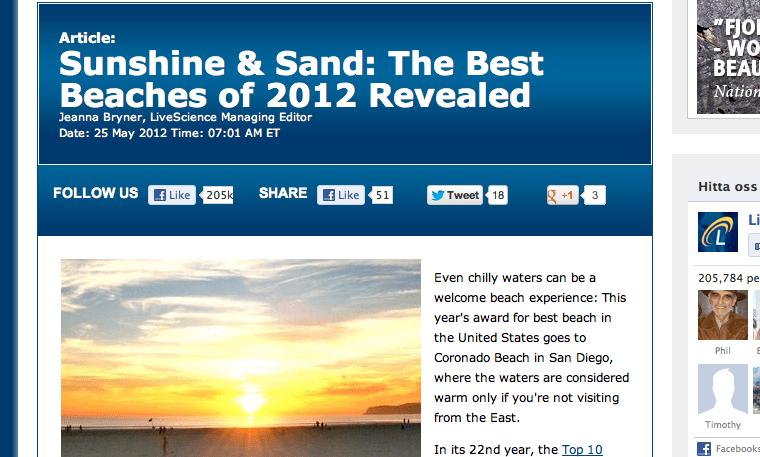 • Applying a scientific approach to the subject, livescience.com has found the world’s best beach of 2012 to be the Coronado Beach in San Diego, California. That may be a bit surprising to some readers, but the survey backs it up with facts like “The flat, hard-packed sand makes the beach great for walking, and there is a lot of that to be had as the beach extends for some 1.5 miles”. But there are many more, and long, beaches on the list, so be sure to check it out. 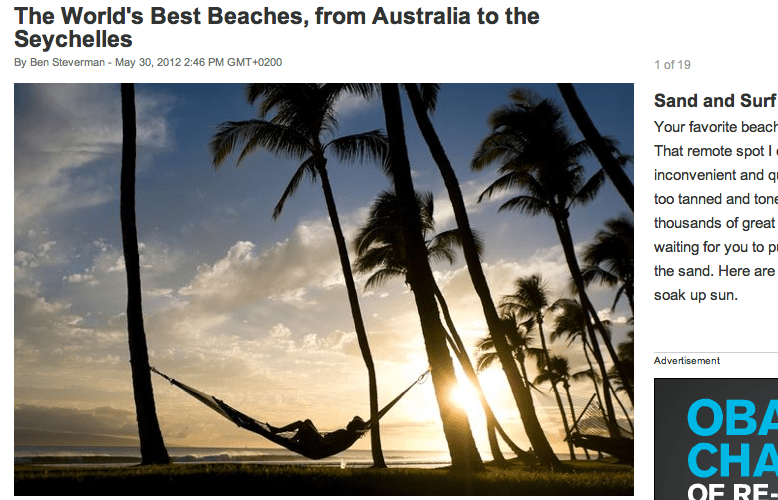 Bloomberg’s best beaches of 2012. • Financial news agency Bloomberg has, somewhat unexpectedly, put together its own list of the world’s best beaches, headlined “The World’s Best Beaches, from Australia to the Seychelles“. Because of the odd provider, if nothing else, it is kind of fun to compare the findings of Bloomberg with those of the other. For example, the Bloomberg list carries one category, “Best Beach for Fossils”, that might not be too common in the usual summer travel destination ranking lists. Two beaches covered on the list of 18 beaches are the “Most Expensive” and “Most Politically Controversial Beach”. ← Previous Story Can you afford going the same place twice?